Look, I'm not one to bask in my own successes. I mean, the self-praise tag only has nine entries. While that is three times as many as the "actual journalism" tag, it's only half of the "HSW Newsflashes" tag. Also, I shouldn't have pointed that out because now it's abundantly clear that very few of our news items are actual journalism. Damn! But I digress: Last year, it took us 365 days to reach 100 posts. Literally! It was the afternoon of December 31st, 2009 that we hit the century mark, and it took our biggest month ever to do it. 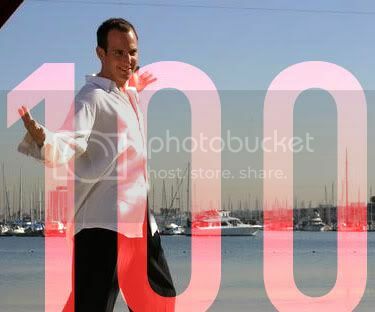 And here we are, at the onset of August, amidst the summer heat, beaches teeming with vacationers and sweatbeads rolling gracefully into my crack, already registering our 100th post of the year. What can I say? It's been a prolific year for music, and what kind of blogger would I bet to leave any one of these many stones unturned? As always, thank you (ed: "thank you" only has 3 tags) for your continued support of the blog. We have more followers--bot and human--than ever, and we're getting more poll votes too. So thanks for validating my efforts and not calling me out on my many grammatical errors.